Staying on top of your personal finances can be challenging, tedious, and even discouraging, but for most people this process is a necessary evil. Spending more than you earn is a sure way to bury yourself in debt, and not being careful about precisely where your money is going can leave you struggling to pay for necessities like groceries. Fortunately, learning how to keep track of your personal finances is not difficult, but it does require a fair amount of time and discipline. Following either of the methods below will help you down the path of becoming better with your money. Create a system. The most important part of keeping track of your finances is consistency. Regardless of which way you choose to log your transactions, you have to be able to refer back to them easily and reliably. Be sure to include important information like the date, amount spent or gained, and expense category with each entry. Also be sure to make your recording consistent. For example, you can record transactions as soon as they happen, every time you get home, or even once a week. Expense categories are an easy way to figure out what you spend the most money on. These categories may include things like housing, utilities, household expenses, groceries, health care, pets, personal expenses, and entertainment. These categories will of course vary from person to person and you can be as specific or general as you want with your categories. For example, you may simply want to record expenses as either need or wants. The important thing is that your categorizing is consistent between transactions. Keep a notebook. The absolute simplest way of tracking your finances is to write a record of each transaction in a notebook. By always carrying this notebook, you are able to know exactly where every dollar came from and went. At the end of each period (week or month), you can also transfer the information to a computer spreadsheet so that it is more accessible. You can organize this notebook in several different ways. For simplicity, you may simply choose to use the notebook for spending. Alternately, you can treat it more like a logbook and record both your income and your expenses and how they affect the balance of your checking account. 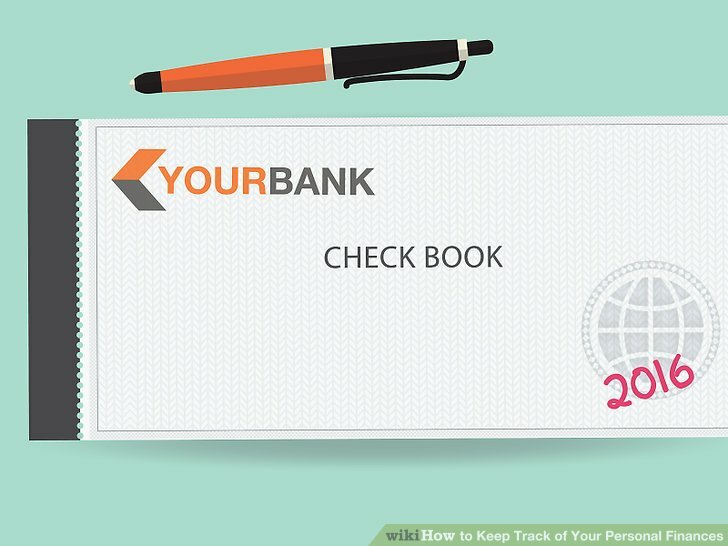 Some people choose to use a notebook to track cash expenses only, combining it with debit and credit card expenses at the end of each month or week. Use a computer spreadsheet. 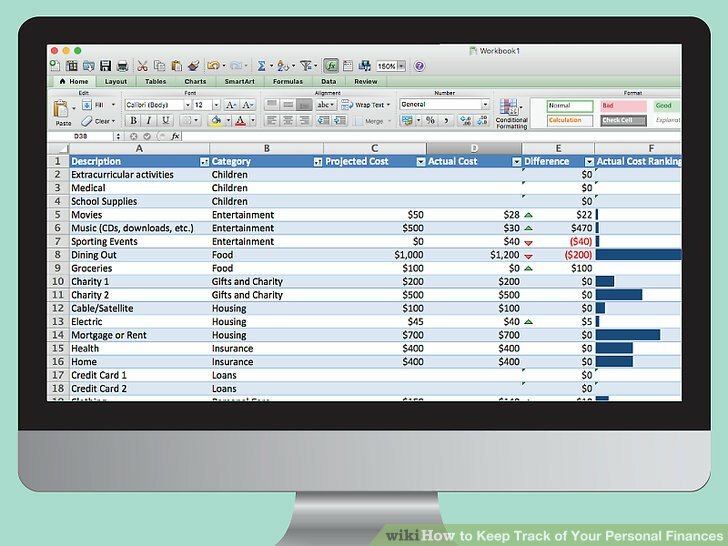 By using a simple spreadsheet on a program like Microsoft Excel, you can organize your expenses clearly and even create graphs easily to better understand your spending. They are many specific ways to do this, but a good start might be to create a personal budget. This would be done on a week or monthly basis, and include information like the amount, category, and date for each transaction. 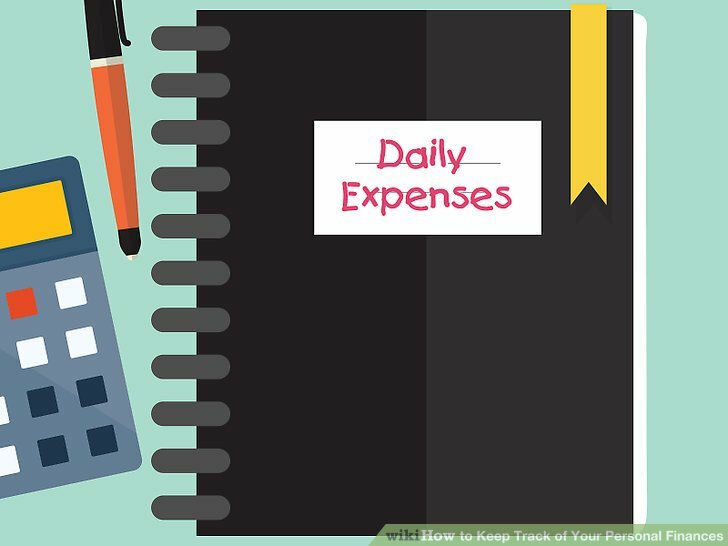 To create a personal budget, start by listing your fixed expenses each month (like rent and utilities) as an expense on the first day of each month, along with your expected income for that month. You can then subtract other expenses or add other incomes as necessary throughout the week or month. Analyze your finances at the end of each month. Regardless of which method you choose to keep track of each transaction, you will need also need some way of combining and analyzing your spending at the end of each month. This will allow you to see where your money is going and allow you to make adjustments for next month if needed. 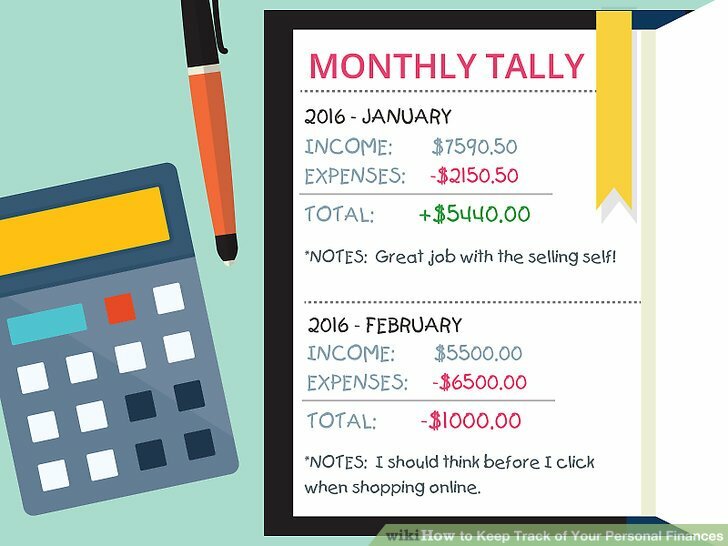 Start by totaling your expenses and compare the sum to your income for the month. Obviously, if you're spending more than you're making, you'll have to identify the source of your overspending and try to make a change for next month. To identify where your money is going, you can try totaling your spending by category. That is, you should combine the totals spent in each expense category and compare them either to each other or to your total expenditures. Specifically, you can divide the total of each category by the sum total of all of your expenses for the month to get the percentage of total expenses accounted for by that category. This will allows to you identify areas where you might be overspending. You can also use this information to create a working budget for next month. Select a personal finance app. 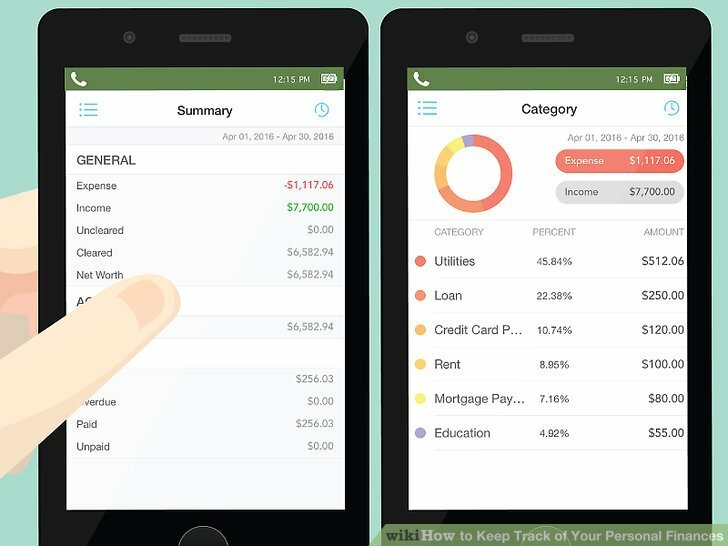 There are a multitude of personal-finance apps available both for mobile phones and web browsers that offer services to track, tabulate, and analyze your expenses. These apps also offer a range of comprehensiveness, from simply acting as a budget-creation tool to displaying all your assets in one place. In choosing one, keep in mind your financial goals and ability to commit to using the app. Input your information into the app. If the app you have chosen requires bank information, input your information and wait for the app to sync with your accounts. 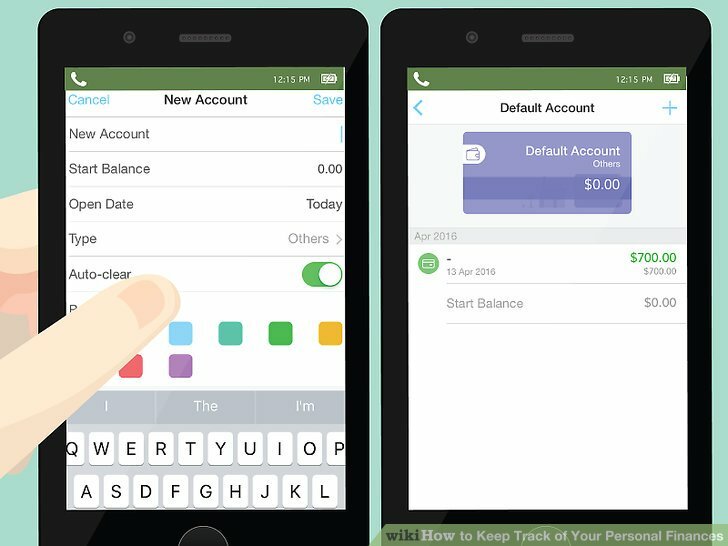 Alternately, input your own transaction information as you spend money and watch the app work its magic. The apps will guide you during this process. Study the app's analysis. At regular intervals, the apps will supply you with analyses of your spending habits. Be sure to actually read these reports and think about adjusting your spending habits if necessary. 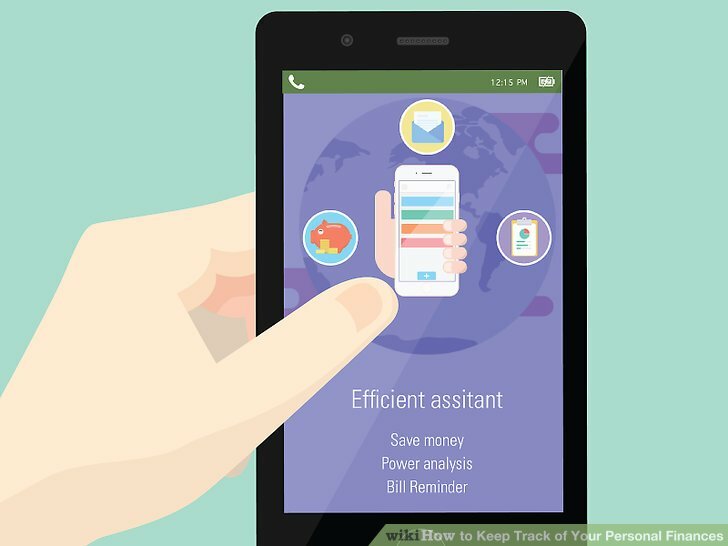 Some apps will provide guidance on how to save money in certain areas. 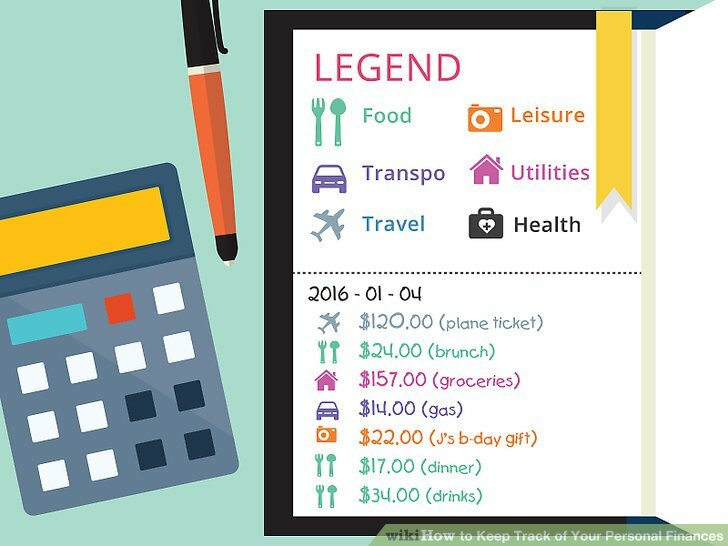 This article is mainly about keeping track of your expenses and income. For more information about managing your finances and saving money, see how to save money and how to manage your finances. Try to minimize your use of cash, as it tends to be more difficult to track than debit or credit card expenses.